The Nissan Armada is a popular full-size SUV here at Lithia Nissan of Medford for a number of reasons. Nissan engineered the Armada with advanced and innovative performance features that enhance power and efficiency. You can check out a few of its performance features below. A 5.6L V8 is the engine that comes with the Armada. This gasoline engine has Direct Injection and can deliver 390 horsepower and 394 lb.-ft. of torque. It has a maximum towing capacity of 8,500 pounds, and it comes with VVEL valve control that improves fuel economy and enhances throttle response. The powerful 5.6L V8 engine is paired with a seven-speed automatic transmission that comes with Downshift Rev Matching and Adaptive Shift Control. 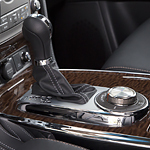 Downshift Rev Matching includes idle neutral control, wider gear ratios, and automatic transmission fluid warmer. The transmission and engine work in conjunction for more power at low speeds and a quiet engine at high speeds.